Two small robots have begun hopping around the surface of asteroid Ryugu. The rovers, each the size of a small frying pan, move around the low gravity of kilometer-sized 162173 Ryugu by hopping, staying aloft for about 15 minutes and typically landing again several meters away. On Saturday, Rover 1A returned an early picture of its new home world, on the left, during one of its first hops. 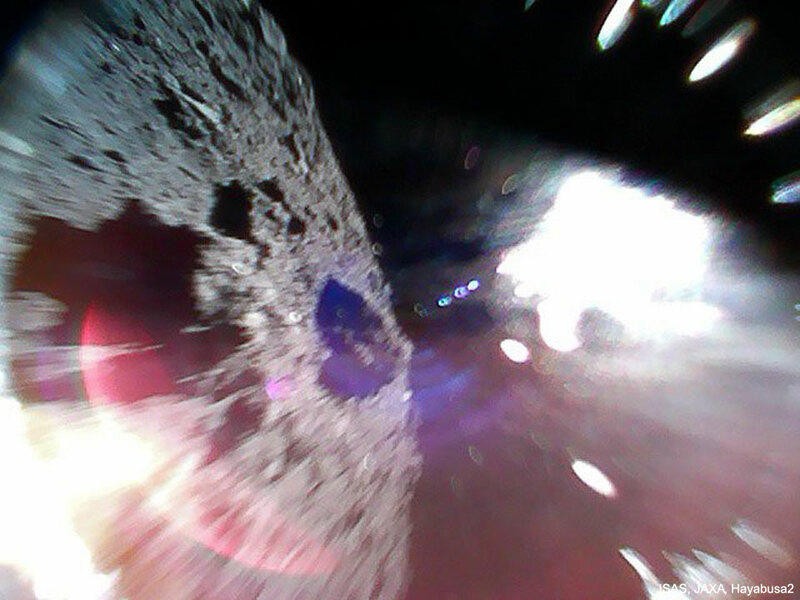 On Friday, lander MINERVA-II-1 detached from its mothership Hayabusa2, dropped Rovers 1A and 1B, and then landed on Ryugu. Studying Ryugu could tell humanity not only about Ryugu’s surface and interior, but about what materials were available in the early Solar System for the development of life. Two more hopping rovers are planned for release, and Hayabusa2 itself is scheduled to collect a surface sample from Ryugu and return it to Earth for detailed analysis before 2021. Posted on Monday, 24 September 2018 by VGC	This entry was posted in ifttt-photograph and tagged IFTTT, NASA. Bookmark the permalink.